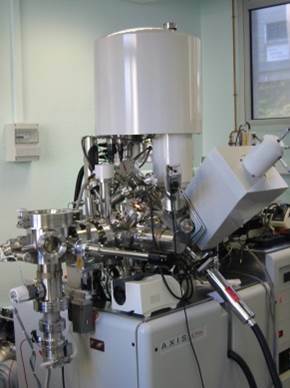 XPS, X-ray Photoelectron Spectroscopy is a surface analysis technique which provides both chemical and electronic properties. Through the photoelectric effect, photoelectrons are ejected from the surface illuminated with a X-ray source. They have characteristic binding energy which depends on the element, orbital and chemical environment of the atom. This technique allows the detection of virtually all elements present on the surface (probing depth 1 to 10nm). In the context of our laboratory studies, XPS is particularly suitable for the identification of chemical bonds showing the functionalization of surfaces and materials and for the calculation of stoichiometric ratios of thin layers. This equipement is open to intra- and extra-IRAMIS collaborations.